Catering to the Ottawa Region with delivery and installation included, we make Custom Framed Mirrors to fit any budget, any taste and any space. 1) Measure the space that you want the mirror to fill on your wall. This will include the frame. 2) Come into Walkerworks with your sizing needs and any visual aids for us. 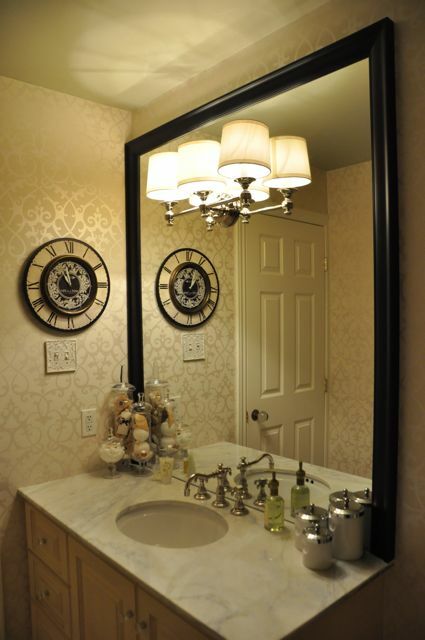 For instance, if you are matching up your mirror to any existing furniture or fixtures, bring in a drawer front, knob, paint chips or pictures if you can…. but it is totally okay if you don’t. We’ll let you take home some moulding samples if you aren’t sure what the frame will look like in your space under your lighting so that you can rest assured that your mirror will look great. 3) With our help, you will choose from over 1000 moulding samples on our wall to choose the frame that will look great in your space. You will also decide on a regular polished edge mirror, or on a bevelled mirror. We have several here so that you can see the difference. Our computer program will tell us exactly how big the mirror inside the frame will be and we will be able to give you an exact pricing quote. 4) You will either decide on your first visit to us on the design for your mirror, or you will take home a few samples to look at in your space. When you have decided on the moulding choice, you will make a 50% deposit with us and carry on with your life knowing that soon, very soon, you will be enjoying a brand new mirror. 5) In around 3 weeks, give or take or on a specific date if you have a hard deadline for us, we will have your custom framed mirror complete. We will call you to make an appointment to deliver and hang it. There will be no extra charge for this service: we want to make sure that your mirror is hung safely on your wall using the proper hardware. 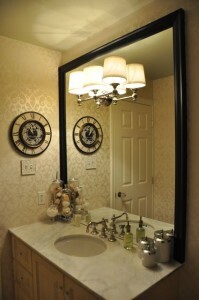 6) Smile and enjoy your reflection in your new custom mirror!